​If you believe the version of professional cooking portrayed in books like Anthony Bourdain’s best-selling Kitchen Confidential, kitchens can be harsh, eat-or-be-eaten environments. But Zohar’s is calm and happy, and though the chef is clearly in command, she has an easy banter with her nearly all-male crew (her sister is the pastry chef). ​Zohar is part of a small group of female chefs at the helm of restaurant kitchens across Israel. (Seeking new opportunities, Zohar plans to transition soon to a consulting role at Ca Phe Hanoi, allowing her time to open Israeli pop-up restaurants in Israel and the United States.) My informal survey counted three in Tel Aviv and three in Jerusalem, and this is out of hundreds of restaurants. In a country that claimed one of the world’s first female heads of state—Golda Meir became prime minister in 1969—and now allows women in certain combat positions in the military, it is remarkable how slow it has been to promote women to executive positions behind the stove. If the United States is now grappling with the #MeToo movement, including in some high-end restaurants in New York City and New Orleans, equal treatment of women in Israel—in the kitchen and elsewhere—remains a significant challenge. ​If given the choice between two equally qualified candidates, Priel says she always chooses the woman for a kitchen position. “We see things men don’t, both in the pot and on the plate,” said Priel. 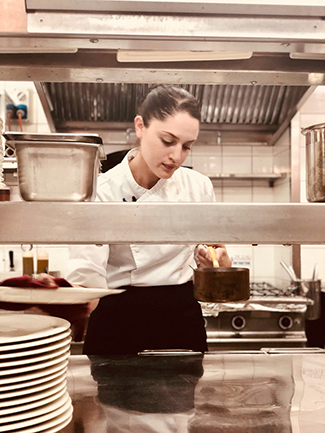 “Men cook by the book—women learn the book and add intuition.” She believes that extra touch leads to more visually arresting plating and nuanced finishes on menu dishes like grilled artichokes with corn cream and Parmesan cheese. ​But not every chef believes in distinctions between men and women in the kitchen. 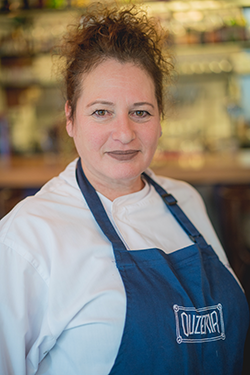 Rima Olveira, 51, a transplanted San Franciscan, cooks iconoclastic, international cuisine at her elegant Tel Aviv restaurant, Oasis. Perhaps because Israel is predisposed to “macho” culture, female chefs feel they need to establish clear boundaries early in their careers. Simone Shapiro had already logged several years working at star chef Thomas Keller’s now-closed Bouchon Bakery in Beverly Hills when, four years ago at 21, she fell in love with Israel after a trip to visit her sister. 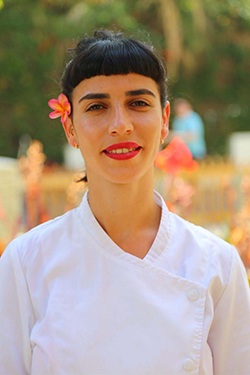 She began working at the rooftop restaurant of Jerusalem’s Mamilla Hotel, where she rose rapidly through the ranks and now serves as executive chef. These dairy recipes—created by Tel Aviv’s leading female chefs—are perfect for Shavuot, which this year begins the evening of May 19. 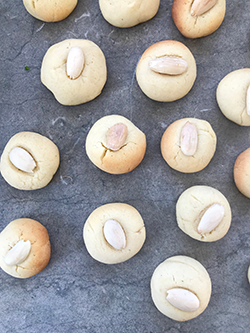 The marzipan cookies become increasingly moist and delicious one to two days after baking, and the spinach-ricotta roses are a Shavuot family tradition for Nofar Zohar. 1. In the bowl of a stand mixer fitted with the paddle attachment, beat the marzipan, butter, sugar and salt until incorporated, 3 to 4 minutes. Add the eggs one at a time and beat, stopping the mixer and scraping down the bowl if necessary, until a soft paste is formed, 2 to 3 minutes. Add the flour and continue to beat until just incorporated. Cover and let dough rest for 30 minutes. 1. Line a colander with paper towels and place the ricotta inside to drain any liquid. 2. Make the dough: In a large bowl, whisk together the flour, sugar, yeast and 1 teaspoon salt. Add the water, 3 tablespoons olive oil and milk, then stir with a wooden spoon to combine. 3. Transfer to a lightly floured work surface and knead the dough until smooth and no longer sticky, adding a bit of flour at a time if necessary, 6 to 7 minutes. Place dough in a lightly floured bowl, cover with plastic wrap and let rest in a warm place until doubled in size, 1 hour. 4. Heat the remaining 2 table-spoons olive oil in a wide skillet over medium heat. Add garlic and cook until lightly golden, 2 minutes. Working in batches, add the spinach and cook, stirring, until wilted, 3 to 4 minutes. Transfer spinach to a bowl and cool for 15 minutes. 5. Using your hands, squeeze out and discard liquid from cooked spinach. Add strained ricotta to squeezed spinach along with remaining teaspoon salt, oregano, za’atar, sumac and lemon juice. 6. Preheat the oven to 350°. Uncover the dough and roll it out to 1/4-inch thickness on a lightly floured work surface. Using a 4-inch cookie cutter, cut 10 rounds of dough. With a paring knife and working from the outside of the dough, cut 4 evenly spaced 1-inch-long notches into the dough. Mound 2 tablespoons of the filling in the center of the round. Working with one “petal,” pull the dough around the filling, then pull the next piece around the first and repeat with the remaining pieces of dough until a rose shape is formed. Repeat with remaining dough and filling. 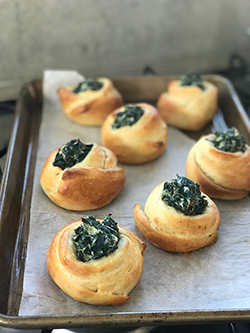 Arrange roses on parchment-lined baking sheets, brush dough with egg beaten with 1 teaspoon of water and bake until golden and puffed, rotating the sheets midway for even brownness, 15 to 16 minutes. Prepare the vegetables: Bring a medium pot of salted water to a boil. Add the Brussels sprouts, cook for 2 minutes, then drain and pat dry. Heat 2 tablespoons of the olive oil in a large nonstick skillet over medium-high heat. Add the sprouts and cook until crisped, 5 minutes per side. Remove to a plate and wipe out the pan. Holding the cauliflower by the stalk, grate it on the large holes of a box grater into a bowl. Heat the remaining olive oil in the skillet over medium heat. Add the shallots and garlic and cook 1 minute, then add the cauliflower and cook until tender, 9-10 minutes. Season with salt and white pepper to taste, transfer to a bowl, cover and keep warm. Prepare the sauce and fish: Heat the skillet over very high heat, then place the butter in the pan and cook until browned, 1-2 minutes. Add the blood orange, cook for an additional minute, season with a pinch of salt and finish with chopped parsley. Transfer the sauce to a small bowl, cover with foil to keep warm, and wipe out the skillet. Using a sharp knife, score the skin of the fish with 2-inch-long shallow cuts, then season with salt and pepper. Heat the skillet over medium-high heat, then add half the vegetable oil and place 2 fish fillets in the pan, skin-side down, until crisped, 2-3 minutes. Flip and cook for 1 additional minute. Repeat with the remaining vegetable oil and 2 fillets. 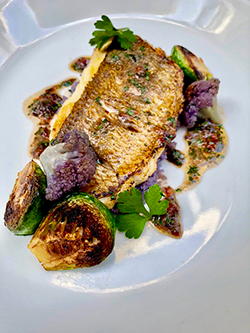 Divide the cauliflower and Brussels sprouts among 4 plates, top each plate with a fish fillet, and drizzle each fillet with some of the brown butter sauce.